Adoption was always a part of our agenda even if we could have a biological child. Unfortunately that didn’t happen and we plunged into adoption. That decision changed our lives forever. We clearly remember the day we were shown Shreya’s photograph – sleeping soundly in a crib. We fell in love with her picture and knew that very moment that we wanted her. Soon enough, the day came when we brought her home from Bal Ashraya in Nagpur. The first few weeks were a struggle with us not knowing much of how to go about raising her. Slowly and steadily we learnt and continue to learn till date. It is a wonderful feeling, one that cannot be expressed in words. The joy of being a mother and a father is incomparable to anything else in this world. Shreya is the reason for all this happiness in our lives.Every day is an adventure with her. How she learns things in her own way, how she has a huge fan following of relatives and friends literally dancing to her every tune. Her grandparents adore her and dote on her. How it’s impossible to believe that a tiny person like her can command every one around her. I, as a woman and a mother feel that she is absolutely and completely a part of my body and soul and do not feel that I have adopted her. She is totally ours now in all aspects. It is wonderful and incredible to watch her grow in front of our eyes. She pulls at our heartstrings when she is not well or gets hurt. One dazzling smile from her makes us forget all our pains. 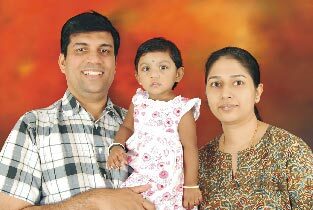 Our experience of adopting Shreya was wonderful. Bal Anand and Bal Ashraya guided us with all the procedures and formalities and we did not face any difficulties at any point of time. We have the utmost regard for the staff of Bal Anand and Bal Ashraya for the noble work that they are doing. We feel that if every family adopts atleast one child, then these beautiful children will have a safe and secure home and a secure future they deserve.